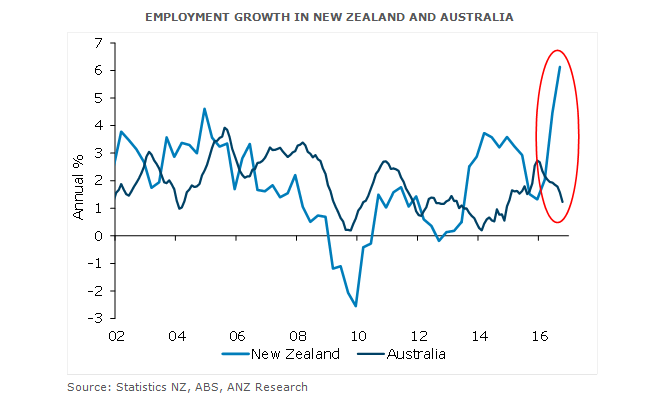 With employment opportunity a major driver of migration flows, ANZ’s job advertisement data for NZ hasn’t had a single monthly fall in 2016. This underlines the idea that even if methodological changes mean official employment growth data is overcooked, the labour market is very tight. On the other hand Australia’s latest labour market data missed expectations. Australia’s unemployment rate is 5.6 per cent versus NZ’s 4.9 per cent, despite a 10-year low in the Australian labour force participation rate. The flows of New Zealanders across the Tasman can have a huge impact on net migration numbers, but of course cannot be directly controlled by government policy the way arrivals of those on foreign passports can. Even on that front, long lags between immigration policy changes and arrivals also contribute to making it far more difficult to steer (or predict) net migration than is generally recognized. There is a good reason the Reserve Bank of NZ refers to its net migration “assumptions”, rather than “forecasts”. All that said, short of a more damaging earthquake, it is difficult to see anything on the horizon which would make New Zealand lose its shine as a relatively attractive place to live and work given current global uncertainties. Source: ANZ BlueNotes. Sharon Zollner is an Associate Director & Senior Economist at ANZ NZ.